Tonight's meal from the South African country of Lesotho features simply prepared vegetables as the stars of the show. True to my goal of cooking less meat in 2011, I chose two dishes typical of Lesotho's cuisine, which, eaten in combination provided a satisfying and healthy meal. Nothing fancy or complicated, just healthy, tasty vegetable dishes. Okay, I will admit that the meatatarian males in my house whined with such pathetic persistence, that I caved and fried some chicken cutlets just to shut them up. I, on the other hand, was perfectly happy with vegetables as the main course. 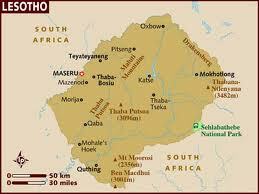 Located in the southern part of the African continent, Lesotho is officially known as the Kingdom of Lesotho. The country is a completely landlocked enclave, surrounded by South Africa. Translated, Lesotho means "Land of the people who speak Sesotho." Like many African countries, 40% of the people of Lesotho live below the poverty line, some subsisting on as little as $1.25 (U.S.). Cuisine in Lesotho is heavily influenced by the Malay culture. Spicy curries, chutneys, pickled fish, pork and lamb kabobs are typical fare. As in many African countries, carbohydrates such as maize, cassava, rice and plantains are common staples. Peanut based stews, eggplant, tomatoes and spinach are also commonly eaten throughout the country. Fry the onion in the butter until lightly browned, then add the potatoes and stir occasionally until they are warmed through. Add all the dry ingredients and the lemon juice to the stock then pour this mixture over the vegetables. Cook and stir until the sauce has thickened and then cook for about 5 minutes more until potatoes have softened. Final Assessment: Two lovely and simple vegetable dishes, I'd eat any time, any day. The pumpkin seeds add a nice crunchy touch to the spinach and zucchini dish. The curry potatoes were very good, with a nice combination of sweet and spicy. Both can be served alongside meat, rice and chutney. I was a U.S. Peace Corps Volunteer in Lesotho for 2 years. I'm not sure where you got your info on their cuisine, but Lesotho is not your typical African country. Maize is indeed a staple there, but cassava, rice and plantains are not. Rice is shipped in to some degree, but cassava and plantains would be rare. The climate is chillier due to the altitude and it even snows in the winter. Most Basotho eat a steady diet of papa (called pap in South Africa), known by ugali or nsima in other regions of south and east Africa. This is a rather bland corn mush that is quite good in the company of other foods, if they could afford it. All the vegetables used in your recipes would be obtainable at certain times, but not eaten regularly. They were found of cabbage and would also collect wild greens. Hope this helps. I love your idea of cooking your way through the countries. Feel free to e-mail me if you have any other questions. r k nolan at gmail. I love curried potatoes and onions but am just intrigued by the addition of pumpkin seeds. What a wonderful sounding recipe - thanks for sharing.